One of the goals of Lina’s Dream is to foster research into breast cancer for younger women. Since founding Lina’s Dream, some of the fundraised amounts have gone to funding two major research projects. Below we describe these in more detail. The Lina's Dream Fellowship was established to foster independent breast cancer research in BC, specifically in the area of breast cancer in younger women. 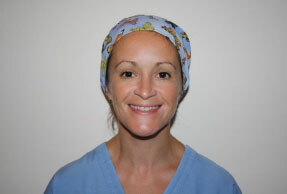 We are very pleased to announce that in February 2013 Dr. Esta Bovill was awarded the one-year Lina's Dream Fellowship . Women who have a family history of breast cancer and test positive for the mutated BRCA gene as a result, are at a high risk of developing breast cancer. Those who are in this position can opt for a mastectomy to significantly reduce their risk but the average wait time for this surgery in BC for this reason is one to three years. Dr. Bovill's research will focus on investigating whether long wait times to have a mastectomy for young women at risk for hereditary breast cancer increase the likelihood they will develop breast cancer during the wait time. Dr. Bovill is a Plastic Surgeon with training in London, Oxford, and South West UK. She specializes in breast cancer reconstruction and has spent time with world-‐renowned surgeons in Toronto, Banff and Winnipeg to further her experience in this field. Dr. Bovill has extensive research experience, having been awarded a PhD in Molecular Medicine from the University of London in 2009, and has 20 published articles in peer-‐reviewed journals to her credit. It has been discovered that 60-‐80% of women diagnosed with mutated BRCA genes are at high risk of developing hereditary breast cancer. As a result, many women choose risk-‐reducing mastectomy, with or without breast reconstruction as a way to reduce the risk of developing breast cancer, particularly in younger women. Post surgery, the risk of breast cancer is estimated to decrease by 90%. In the UK, laws require that when the mutated BCRA gene is discovered and the patient chooses a mastectomy, this procedure must be done within 16-‐18 weeks of diagnosis. In BC the wait time is 1-3 years, during which time the patients are at risk for developing breast cancer and are subject to psychological stress. Dr. Bovill's objective is to review BC patients to determine their average wait-‐time from diagnosis of the mutation to when they have a mastectomy and compare their incidence rates with those in the UK to determine if there is increased development of breast cancer associated with longer wait times. This study will highlight the importance of quicker treatment for those women diagnosed with mutated BRCA genes and guide decision-‐making amongst clinicians and policy makers. The aim is to improve both psychological and clinical outcomes for young women at high risk for hereditary breast cancer.